The project was developed in partnership with the School of Arts and Culture @ MHP, Kinan Valdez of El Teatro Campesino, and Father Jon Pedigo of Guadalupe Church. The first production was funded in part by the Knight Foundation, the Castellano Family Foundation, Applied Materials Foundation, Fleishhacker Foundation, the Office of Cultural Affairs of San Jose, Silicon Valley Creates and Friends of Opera Cultura. This online broadcast will be posted on Opera Cultura's Facebook page. We will post the video recording of our 2014 production of Cuentos de Peregrinación (Tales of Pilgrimage). This is the second-to-last event in Opera Cultura's celebration of National Hispanic Heritage Month (Sept 15-Oct 15). Don't miss the grand finale Canto: New Voices Concert on October 6 in San Jose! 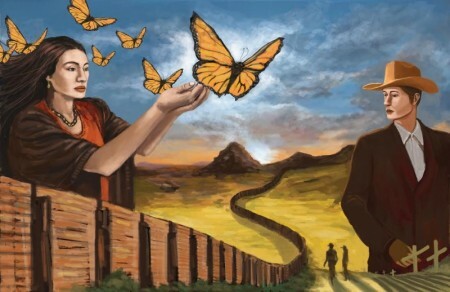 Cuentos de Peregrinación is a song cycle opera based on stories collected by composer Héctor Armienta, and retells the heart wrenching and inspirational stories of Mexican immigrants who have made the arduous journey from Mexico to the US. This work is intended for the community and those that want to celebrate the contributions of all immigrants - including those within our own family. Cuentos de Peregrinación was produced in 2014 at the Mexican Heritage Theater in San Jose, directed by Kinan Valdez, and conducted by Temirzhan Yerzhanov. CLICK HERE to see what else Opera Cultura has planned in celebration of National Hispanic Heritage Month!